Hudson Farms is a six-generation family farm owned and operated by Earl and Liz Hudson of Sanger. Their son Rodger actively farms with Earl. Rodger and his sister Charlotte are part-owners. Rodger’s wife Emilee also helps support the family farm. The Hudsons have long-time ties to agriculture, having grown up in farm families with more than 100 years of farming history in the area, and having been farmers during their 30 years of marriage. The Hudson Family farms about 180 acres of peaches, plums and nectarines south of Sanger and in the Del Rey area. 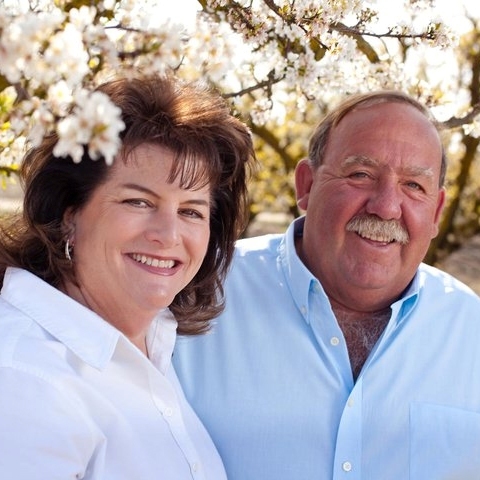 They market their fruit through Wawona Frozen Foods and Wawona Packing Co. Earl began farming on his own in 1978, and the couple has been farming continuously since their marriage in 1981. During harvest, the Hudsons operate a farm stand which sells its fruit and vegetables directly to consumers. Hudson Farms Fruit Stand began in the summer of 2011, and is open from mid-June through September, depending on the harvest season. Earl’s family has been in the Sanger area since 1870s. His parents, Russell and Augie, farmed south of Sanger for more than 40 years. Earl’s paternal grandparents were active in the Sanger community, with his grandfather, Earl, serving as the long-time manager of the Bank of America and his grandmother, Ila, being involved in the Sanger Women’s Club and Sanger Methodist Church. His grandmother’s family farmed for several generations in the Dinuba and Parlier areas. Earl’s maternal grandparents, the Heintz’s, lived and farmed in the Easton-Oleander area. Liz’s family also has been involved in agriculture in the area for several generations. Her father and mother, Walter and Doris Halemeier, farmed in the Lone Star area for more than 50 years. Liz’s paternal grandparents began farming in the Lone Star area in the late-1800s/early-1900s. On her mother’s side, the Heringer family’s farming roots can be traced back to the 1850s along the Sacramento River near Clarksburg. 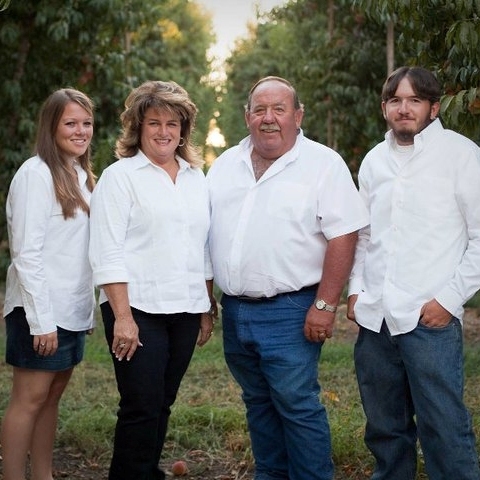 Rodger is the family’s sixth generation to farm in California. Both Earl and Liz are products of Sanger schools and are involved in the community. 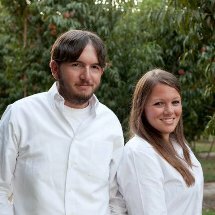 They were named Sanger’s Mr. and Mrs. Farmer in 2009, by the Sanger Chamber of Commerce. Earl is an active member of the Sanger Eagles Lodge, serving as co-chair of the annual fish fry each spring. He also is a member of the Fresno County Farm Bureau, National Peach Council, and the Masonic, Scottish Rite and Shrine lodges. He is noted for volunteering to barbecue and cook for many worthy causes and his special homemade German sausage is requested by many who have tried it. In addition, Earl has more than 30 years of experience as an agricultural field man and as a pest control advisor in agriculture chemical sales. He also operated a custom brush shredding business for more than 20 years to help supplement the family farm. Liz has more than 30 years of experience in agricultural public relations and communications. In 2010, she retired from the Fresno County Farm Bureau, where she was responsible for the Bureau’s public relations activities, including strategic public relations planning, member and public communications, media and community relations, and agricultural education activities. Liz also has served as a co-owner of an independent communications agency specializing in agricultural and water communications for several clients; working in public affairs for the Westlands Water District; and a reporter/writer for a weekly newspaper, farm trade publications and in radio. Liz’s volunteer involvement includes serving on the Boards of Directors for the California Farm Water Coalition, the Big Fresno Fair, Public Relations Society of America Central California Chapter, and Foundation for Sanger Schools. She is a past president and current member of the Ag One Foundation at California State University, Fresno, as well as a current member of Bethlehem Lutheran Church in Sanger, the Central Valley Water Awareness Committee, Fresno-Kings Counties CattleWomen, California Women for Agriculture Central Valley Chapter, Sanger Eagles Lodge Women’s Auxiliary, Sequoia Guild (Sanger) of Children’s Hospital Central California. 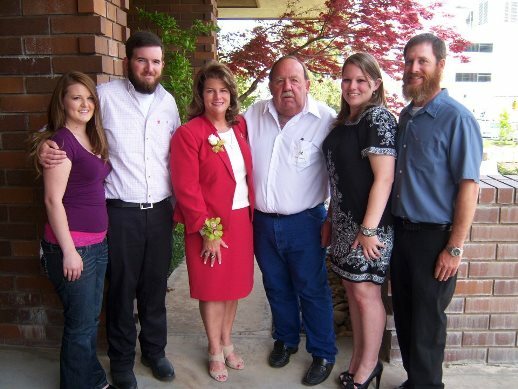 In 2012, Liz was honored by the Common Threads Committee as one of the honorees recognizing women in agriculture, and received the Fresno County Farm Bureau’s “Heavy Puller” award in 2010. In 2008, she was one of 100 Central California women selected to be in Business Street’s “Influential Women 100,” recognized for professional accomplishments, as well as civic involvement. Liz holds a Certificate of Accreditation in Public Relations (APR) from the Public Relations Society of America and was named “Public Relations Professional of the Year” by the Central California Chapter of PRSA in 2005. Both Earl and Liz have been long-time supporters of Sanger Schools while their children attended John Wash, Lone Star, WAMS and Sanger High schools, serving on the boards of PTAs and Sanger Seals Swim Team, Girl Scouts troop leader, and youth sports programs. They still are active supporters of the Sanger Agricultural Foundation for Education/ Sanger High Future Farmers of America Boosters Club. Hudson Farms is a member of the Sanger Chamber of Commerce.